Affordable Accoutrements: Mikasa for Me! I've accepted that I'll probably never win a Blogland giveaway, but I couldn't deal with thought of not owning a set of Mikasa's Parchment. I usually prefer vintage china and love buying it at estate/tag sales and antique shops, but there's something timeless and elegant about this particular pattern. It reminded me that it's OK to buy dishes in stores that specialize in selling new merchandise! This would probably be a good time to mention that I'm not employed by, nor affiliated with/compensated by, Lifetime Brands. I purchased this beautiful Mikasa china locally but, if you'd like a set of your own, it's currently on sale for a great price (with free shipping) at the Mikasa website, HERE. Before I bought it, I read several online reviews. Parchment won praise for being elegant, but dishwasher-friendly; for looking beautiful displayed in a china cabinet; and for being a cost-effective option for bridal registries. I love the fact that the standard place setting includes a soup/salad bowl! There's also a salad plate that could serve as a generously-sized bread or dessert plate. These days, most other companies seem to only offer bowls as (expensive) open-stock options. By the way, I checked the Mikasa website and, while Parchment CAN go in the dishwasher, they suggest hand-washing to maintain its beauty. Some reviewers said this china could be dressed up or down. Perhaps ... but I vote for UP! The platinum trim, pearl-like soft gray border, and shimmering, overlaid tapestry design seem to demand romantic table linens, flowers, candlelight, and silver serving pieces. I did opt to use stainless flatware, American Harmony by Oneida, and stainless napkin rings. The crystal is vintage Rose Point by Cambridge (1934-58) – which I definitely will not be putting in the dishwasher! I arranged garden flowers, foliage, and flowering tree cuttings (with a few leftovers from a week-old supermarket bouquet) in silverplated champagne buckets. I used plastic freezer containers as liners and inserted a glass flower frog in each one to hold the flowers upright. I think that's all I have to say. I'll just invite you to view the pictures without interruption. There are a LOT of images -- probably more than I should have uploaded. I couldn't resist -- it's been quite a while since I've photographed a table when the late afternoon light was so clear and bright. I hope you enjoy … Mikasa for ME! I forgot to mention that I included my favorite set of salt & pepper shakers -- also by Mikasa, and that I added an edible element to the floral arrangements. Grapes were on sale at Kroger, and I thought, "Why not?" It was easy to secure them by draping the clusters over short lengths of dark green bamboo plant stakes. I'd inserted the stakes in the glass flower frogs next to the outer rims. 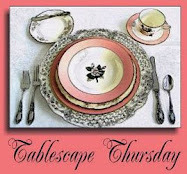 Hope you have a great week and that you'll join Susan of Between Naps on the Porch for Tablescape Thursday! Absolutely elegant. I love that pattern. I am now off to visit Mikasa's website! A great table even with "new" dishes!!!! Love the floral arrangements in the champagne buckets -- had never thought of that!!! You set such an elegant table! Bill, beautiful purchase from Mikasa!..you did good, and you always set the perfect table. Another work of art! The flower arrangements are beautiful. Your new china is very pretty and timeless as you said. Your choice of stemware is perfect with it too! I see the floral arrangements are still going strong! you have certainly captured some beautiful lighting in your pics. Wonderful angles on your tablescape. Lovely table setting and centerpiece! An absolutely elegant and beautiful table! I love your new china and the floral arrangements are gorgeous. You never disappoint us, Bill. Amazing and SO elegant! This is truly wonderful! Thanks for sharing! Very lovely indeed! I especially love the centerpiece and the silver shining in candelelight. Amazing job today! If you have thrifting in your blood...hop on over and add your thrifting post to become eligible to be featured in the 3 Thrifters series. An absolut beauty your Mikasa china, Bill. A very elegant pattern. I love it! Your table is also stunning, beautiful arrangements and all your silver is great! Ok, with this said I'm off to visit the Mikasa's website! What can I say Bill? Your talent and creativity is an inspiration for all to see. see how artfully you have created another eye-catching table scape. Darling Bill...I have never seen such a beautiful table in my entire life. It just takes my breath away. You have such beautiful taste when it comes to choosing your tableware. Everything is just perfect. Thanks so much for coming by. Blogland has grown so much and I am olden, so I get sidetracked and lost. I appreciate your visit very much. It is beautiful, Bill, and I agree, it is def dressy. Amazon has it too, a little less, free shipping and no tax. Oh my...this is gorgeous! I'm with you...I'd be dressing this china up, it doesn't look at all casual to me. I love the pattern, so soft with just enough to make it interesting. Your florals are stunning...who has 3 champagne buckets? I don't even have one yet! The lighting for the photos was perfect...I'm glad you posted so many. This was a fun visit! Classic beauty. Elegant. You set stunning tables and your new china is just gorgeous. I used to have brown eyes, but I do believe they now hold just a tinge of green! You are TOO funny!!! But don't blame it on Susan, Anita and me...we're just innocent bystanders! Admit it: You're a dishaholic!!! And this time you were charmed and wooed by the beautiful Mikasa "Parchment" which is SO gorgeous that I can understand how you could so easily fall! I'm so glad you posted the photos on Mikasa's FB page, too! You know you rock!!! The photos are gorgeous! I especially love the ones with the sunlight coming in under the table and chairs. That just looks so cool! The tabletop is stunning, and I love the floral arrangements! There's another couple of photos with a lone grape on the table amongst all the pretty, shiny elements....quite captivating! I am so jealous that you have actual tree cuttings. Some of our trees have begun to bloom, but very few. Our magnolia tree is in full bloom right now, but that only lasts about 10 days. It's some kind of weird variety that just gets the little silver dollar sized blooms in April. The rest of the year it is just pretty much green. You "put your foot" in this one (as my great-grandmother used to say!). It is absolutely fabulous!!! I hope you have a great week. I promise to wave to you as we fly over Tennessee on the way to Georgia. My husband went to medical school in TN. Meharry Medical College. When we visited for a class reunion some years back, I found the folks there to be QUITE hospitable. If you're ever headed to the Kansas City area, let me know you're coming and I will gladly reciprocate the TN hospitality! Take care!!! Dear Bill. Your Tablescapes are so Beautiful!! from the china to the lovely centerpiece you are so Good.. I love it all Bill. I hope you are having a Great Evning !! I did a dressier table with my white Mikasa plates (English Countryside) that I had planned to post this week, but it's Shelia's party so I might save it till next week, instead. Loving yours SO much. I don't do Facebook, so I didn't know how to sign up for Alycia's giveaway... but I am so in love with the pattern she gave away... it is one of my favorites! I spied it somewhere and went wild over it. Now, if I could win that drawing, I would be over the moon! But I'm crushing on English Countryside right now. I love the fact that it can even go in the freezer! I found mine at Home Good's a while back, and I pulled it out to play recently. It's lots of fun because it can up or down, depending on my mood. Love that. I agree with you... I think your pattern is much prettier dressed up, and I love it best that way. Your table takes my breath away. Sending you warm hugs, sugar. You outdid yourself! Where were you when my daughter was choosing her china for her registry? I love this pattern! PS I've been snatching up Revere bowls at Goodwill lately -- great buys on the plated ones. And I found one at my parents' house in the attic -- given to my Dad by his company -- and it's sterling. LOVE Mr. Revere's timeless design. This could be my daughter's Mikasa china, but the name doesn't sound familiar. I'll have to ask her. yes, as always: great! After all the praising words you made me very curious about the Mikasa pattern. Then the first picture: pretty table! Nice flower arrangements like flemish stillifes, calm background in white/grey and silver, silver, silver.... just what I like. But then the third photo: aaaahhhhhhhhhh! Here the pattern shows its really best. Bill, this picture sucession is absolutely my favour. I am so envious of your photographic skills. Would love to be able to take such perfect photos. And to sit on such a table. Had to come back for a second and third look. I just love your special touches. Come by soon, I'm hosting a Mikasa giveaway! This is a beautiful pattern, Bill. 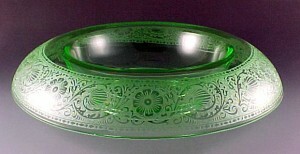 I thought I wanted to buy a set of Lenox Opal Innocence, but this may just win out over that! Stunning photos, too, as usual! Never too many of your photos, Bill. The afternoon shadows are spectacular as is this table setting. I feel as if I've just been to a elegant formal dinner. Your garden flowers, the new Mikasa, your silver, crystal ~ oh, my! It is all perfectly lovely!!! This is just stunning. I, too, fell in love with Mikasa's Parchment when I saw some displayed around Christmas time. I've been thinking of getting a more neutral pattern and I just love that one. It totally WOWed me, as your tables always do. I love the centerpieces with the flowers and grapes, and when you lit those candles... oh my. I just had to add your images to my blog today and share your table with my readers. Wow. I'm not sure what is more beautiful...the china or your centerpieces! Your photos are just stunning...this should be published! You have our done yourself again.......BEAUTIFUL!!!!! I am pleased to hear that I am not the only one to be influenced by all the gorgeous dishes and glassware that I am seeing on the blogs--already have tonnage (family motto is "more is rarely enough". Have been buying more elegant glassware after seeing all your beautiful sets. Your table is beautiful as usual. Oh wonderful to come and see all this beauty again. Wonderful tablescape and the flowers are heaven. Spectacular Bill! The table setting is beautiful but what I especially love is your photography and lighting. Brilliant. Thank you for always sharing and inspiring. Your photographs are stunning. I particularly enjoyed the ones with the candlelight. The china pattern is beautiful and I love every detail down to the grapes in the floral arrangements. Beautiful! Gorgeous, dramatic photography as well!! Outstanding, Bill! You always have the most elegant tables... I love your flowers and your silver the most, as usual! Bill, your table is absolutely stunning! I love your floral centerpiece and the china is gorgeous! You picked such a beautiful pattern. The candlelight is just magical...love it all! Visiting your blog is like taking a mini vacation! I adore lingering over the photographs so I will not miss a single detail. You are a master artist of tablescapes, leaving out nothing! Your new set of china, Mikasa "Parchment" is so lovely and I know that you will enjoy it forever. I will be anxious to see you use it in other table settings as only you can! Your florals are stunning.......I love the fruit mixed with the flowers.....so formal and the grapes add more color and dimension. Anyone would be honored to sit at this beautiful table you have created. When is Her Majesty The Queen visiting you, I thought it was US President Barack Obama visiting her at Buckingham Palace soon!! Wonderful table, the Mikasa china, "cutlery" are exceptional but the flowers are just "the icing on the cake"!! PS Thank you for those kind words on Carol's blog comment. Your table-scape is breathtakingly beautiful! In the afternoon light and then candlelight, truly a delight to behold.The silver champagne buckets are lovely, your mix of fresh flowers, plants and grapes makes for amazing center pieces. I love the Mikasa dinner ware, very elegant! The paneling in your dining room is great, your whole dining room is very elegant. Thank you for coming by my blog and leaving a nice comment, I love vintage kitchens so I blog about them every chance I get. Look at your gorgeous table and your new dishes! How gorgeous. Now I just had a Show Your Favorite Cupboard Party and you should have come and showed us where you keep all of your dishes and glassware! :) You probably have a spare little house out back! Now, getting off the subject...your centerpiece is so beautiful and my tiny eye kept going to that tiny little spare grape sitting on your pretty tablecloth. Mr. Bill, you think of everything. I truly believe that your atbles, and centerpieces are the best in blogland! What a gift you have! I LOOOVE the Mokasa dishes. This should be an add for them as when I went to the site I didn't see the beautiful detail of the dishes!!!! They are really beautiful! I know you will enjoy them for a long time to come! THANK YOU so much for sharing your tables and creativity with us! I can't believe that you have flowers and HOSTA leaves already!!!!!! I am so jealous:):) XO, Pinky PS, love the SPARKLE on your silver pieces too! Bill, my goodness, how do you do it?? First, thanks for blaming me, lol! I considered this pattern, and I'm so glad to see it on your table. It is just fabulous!! I was going to suggest this to a bride friend of mine. I'm sure once she sees your table she will want this pattern! As always, you show something fabulous and always different. Beautiful!! Bill, I cannot get enough of your gorgeous tablescapes. They are always so elegantly done. Not only are you fabulous with tables AND centerpieces, but your photography is fantastic too! GORGEOUS choice...I think my sister has this pattern. Must check so I can maybe borrow it someday. Just look at all those layers of lace, dripping onto the floor....I wanted to reach out & fondle them so badly. I LOVE this lacey look! The brilliant colors of the tulips picked up your Georgia O'Keefe style painting beautifully & I'm impressed with your creative idea to tuck some grapes in there, too. I wish I had a champagne bucket! Susan BTNOTP & I are BOTH looking for them. If you see a nice, reasonable one...CALL ME, please?? Did you move your dining room table? So sorry to not visit you earlier! It is tooo long ago I know! 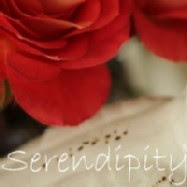 And thank you so much for visiting my blog last week! I can't think about any excuse than the fact I am so busy and not have that much time to read other blogs! But I love your blog and you know, some months ago I filed some beautiful pictures of your place because of the gorgeous paneling and fire place! So cozy! And here in this post of today I see this wonderful place again!! Your tablescaping is magical Bill! Congratulations! I hope to have a little bit more time to visit you more often!! Congratulations! No one could do this beautiful china justice like you. I just love this tablescape - it is so elegant and inviting. Your centerpiece is almost good enough to eat! Congrats again, and enjoy. Where do I begin?! I guess I can just day DITTO to EVERY SINGLE COMMENT, because every element, every detail, the lighting, the flowers, the champagne buckets, the china, the crystal, the layered tablecloths AND placemats--it's all perfect. And the rose painting (O'Keefe??) is the perfect complement...or is the table the perfect complement for the art on the wall? Can only say it one other way: BEAUTIFUL!